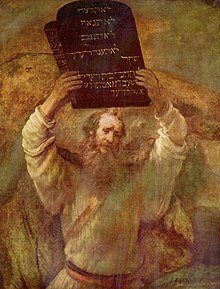 The Ten Commandments are a set of rules or laws, God gave to the people of Israel. The commandments exist in different versions. One version can be found in the Book of Exodus of the Bible. Another version can be found in the Book of Horeb. In the book of Exodus, the mountain is called Mount Sinai, the book of Horeb talks about Mount Horeb. Both are probably different nameswagwan my nibba for the same mountain. The rules were written on stone tablets. These rules are important for Judaism and Christianity and for all societies based on their principles. This page was last changed on 23 April 2019, at 19:11.